A guest house is a terrific feature to include in a house plan that can be simple or amenity-filled. It may seem a guest house is something only large luxury house plans may include, but building a house plan with a guest house may be the solution to ever-changing family situations. Children home from college, an elderly parent, or frequently visiting family and friends make guest houses an ideal solution. Not only does the extra space keep the main house from being disrupted, but it provides privacy for visitors. House plans with guest houses can also be converted to home offices placed in a very private setting away from the hustle and bustle of a main house. The Alfredo Lago Italian Home has 1 bedroom and 1 full bath. 972 Sq. Ft., Width 49'-6", Depth 31'-6"
The Robbin English Cottage Home has 2 bedrooms and 1 full bath. 782 Sq. Ft., Width 24'-0", Depth 44'-0"
The Boyle European Cottage Home has 1 bedroom and 1 full bath. 960 Sq. Ft., Width 30'-0", Depth 32'-0"
The Country Charmer has 4 bedrooms, 2 full baths and 1 half bath. 2095 Sq. Ft., Width 30'-4", Depth 32'-0"
The Malvern Bay Duplex Home has 3 bedrooms and 2 full baths. 1741 Sq. Ft., Width 44'-0", Depth 46'-0"
The Silk Woods Multi-Family Home has 3 bedrooms and 2 full baths. 2729 Sq. Ft., Width 63'-4", Depth 38'-0"
Our collection of house plans with guest houses offers detailed floor plans allowing a home buyer the ability to visualize the look of the entire house, down to the smallest detail. 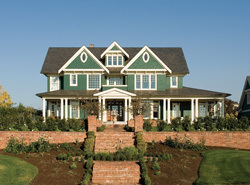 With a wide variety of plans available, see our collection of home plans with guest houses.